Students begin classes with other students who are also new to fencing. As they progress into intermediate and advanced classes, there are more experienced fencers who are happy to provide guidance. Our coaching staff has worked to develop an environment where students feel comfortable learning from others, which is led by Olympic medalist Hongyun Sun and international medalist and Olympic referee Yuanjing Wang. Before joining the Birmingham Fencing Club in 1998, both were Chinese National Team coaches. Most classes follow a similar structure, typically beginning with warm-up exercises, which are sometimes in the form of games. Then, a new skill or strategy will generally be introduced. And mainly, classes will be spent fencing with other students. Classes may also involve mock tournaments, tournament strategy, or activities that develop mental and physical skills. Which class is right for you? Look through our classes page to find the class that fits you (by age). The first step to starting classes is stopping by our Free Fencing class! You'll get a chance to try out the sport and ask our coaches any questions you have about the club, sport, etc. Beginner Youth Foil Programs start in Jan/Feb or Sept/Oct. Learn more about the Beginner Youth Foil Program. Teens and Adults can start at the beginning of any month the week after Free Fencing. Learn more about the Beginner Teen/Adult Epee Class. * Fees, equipment, and other details are below! When you’ve found the class that fits for you, click “Sign Up” and follow the steps to register online. We’ll send you some more details and see you at the next class! Did we miss something? We want to be sure you have all the information you need to understand this new sport and get started. Please reach out with any questions or talk to your coach before or after class. From there, your choose to fence recreationally, competitively, or a mix of both. Fencers choose the sport for a variety of reasons and all of those are welcome at our club. Membership and class fees are $150 monthly. There is a 10% discount each additional family member! The Birmingham Fencing Club provides your equipment for the first month of membership at no cost. 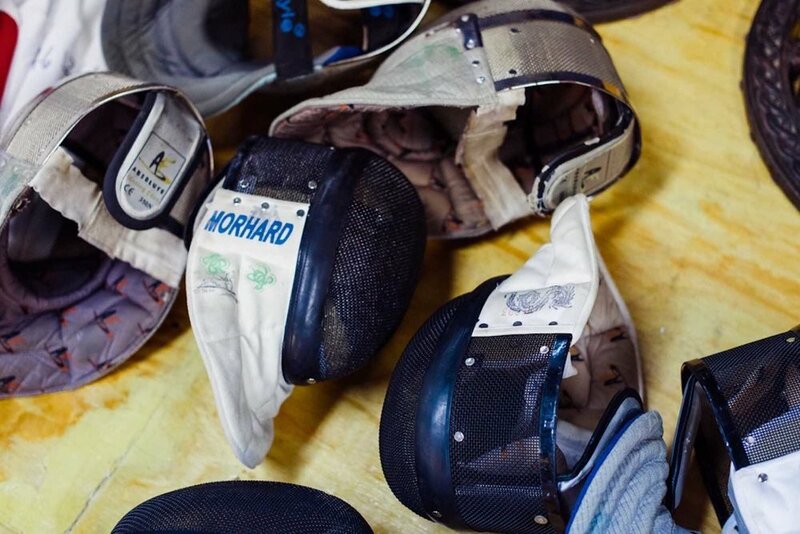 After the first month, you will purchase your own fencing equipment which includes a mask, jacket, plastron, knickers (pants), glove, wired blade/sword, body cord, and a fencing bag. The total cost is approximately $350. There are no physical prerequisites, and all classes are designed for men and women. Fencing is a sport that physically demands more from you as you learn. Because of this, the sport of fencing is often called physical chess. Just like all of us, you will lose to a 6 year old and a 96 year old. We encourage students to compete in tournaments to apply the skills learned in class. Our club and other clubs across the Southeast host tournaments throughout the year. USA Fencing provides tournaments at the regional and national level as well. Costs for tournaments primarily involve travel expenses, with tournament fees ranging from $40 for a local tournament to $180 for national tournaments.